Friends were coming over for dinner. 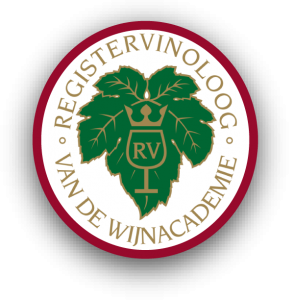 He loves Burgundy wines, especially red. That goes well with meat dishes like Boeuf Bourguignon, but she doesn’t eat meat. What to prepare? Then I remembered the great pairing of a Chambolle-Musigny (red Burgundy) with Tuscan bean soup that we had at Enoteca Pinchiorri last year. Minestra di fagioli is a humble dish, but it is perfect for the season and pairs magnificently with red Burgundy. The plating was inspired by the restaurant. 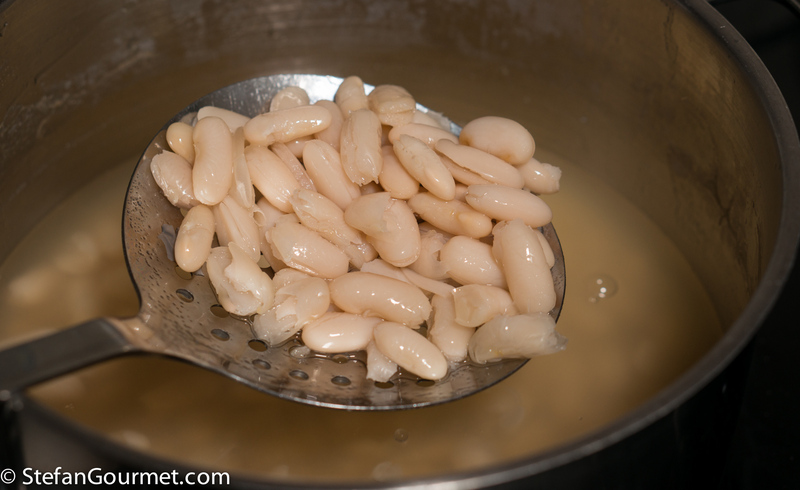 I used white cannellini beans and brown borlotti beans for the nice color contrast, but you could also make this with just one type of beans. You could even make this with canned beans, but the flavor is better if you cook them yourself and even better if, in season, you use fresh beans rather than dry. 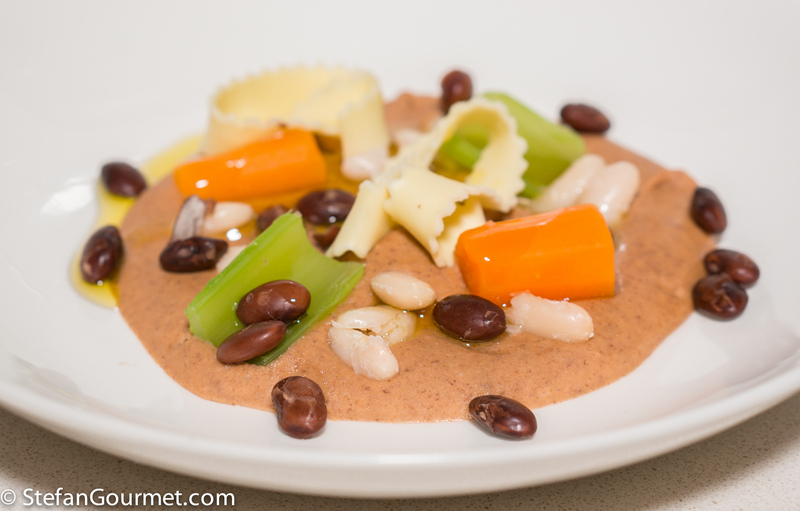 Minestra di fagioli is usually a bean and pasta soup that can be a meal by itself, but as I was serving this as part of a larger menu I only used a small amount of pasta and served small portions. The beans are best soaked in salted water. For each 250 grams of beans, mix 1 litre (4 cups) of water with 2 1/2 tsp of salt (or 1 Tbsp of kosher salt). 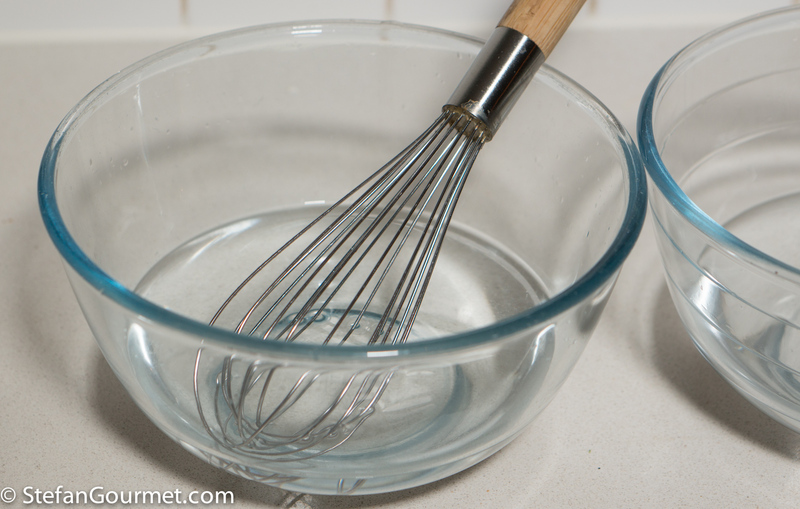 …and allow them to soak for at least 8 hours. 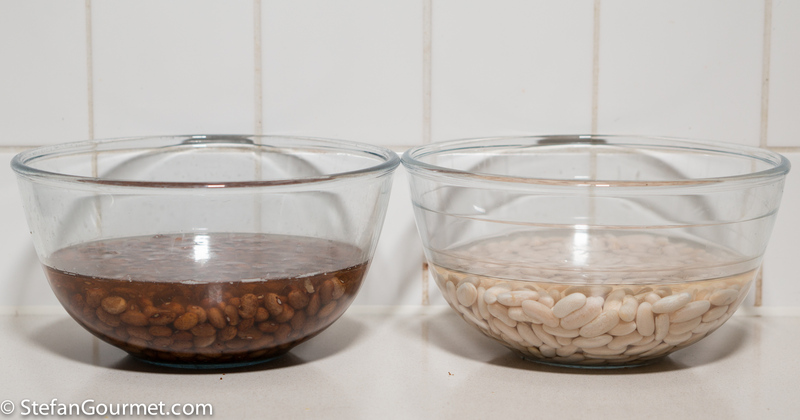 Drain the beans and rinse them with water. 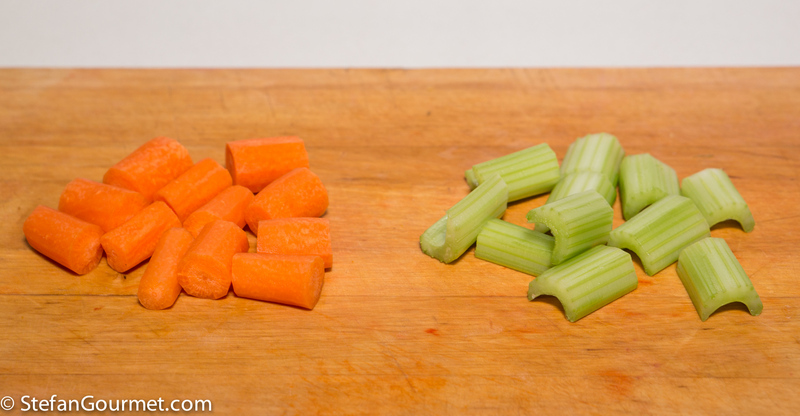 Cut 12 nice pieces of carrot and 12 nice pieces of celery, making sure to peel the tough filaments off the celery first. 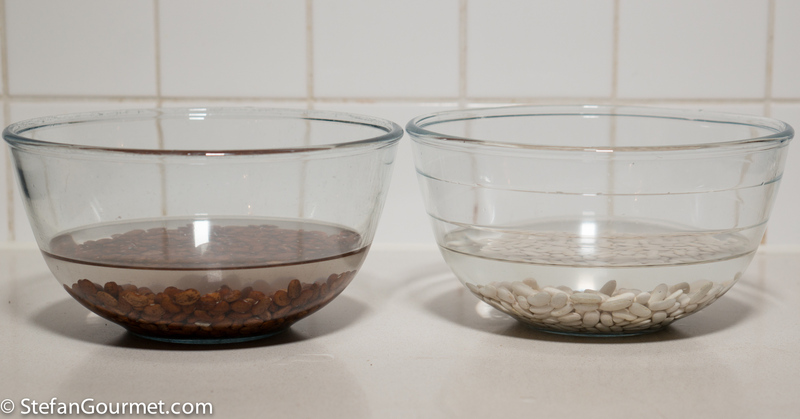 Put the beans in separate pots and cover them with about 2.5 cm (1 inch) of water. Add the trimmings of the carrots and celery, and bring to a boil. The beans should be cooked separately, because the cooking time may be different. Cover the pots. 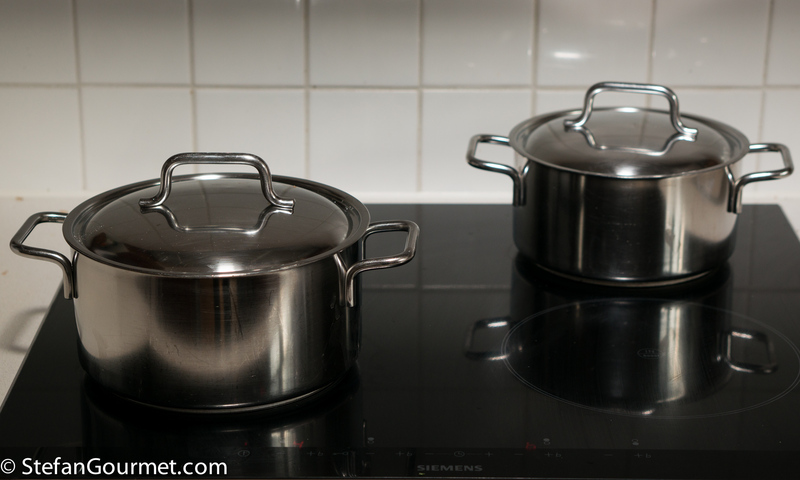 Lower the heat as soon as the water boils. Cook the beans until tender, 45 to 90 minutes. Keep about a quarter of the beans separate, selecting nice looking whole beans. Puree the remaining beans in the blender with as much of the cooking water as needed to get the right consistency (as thick or thin as you like; I kept mine quite thick). Heat 2 tablespoons of olive oil in a large pan or casserole. 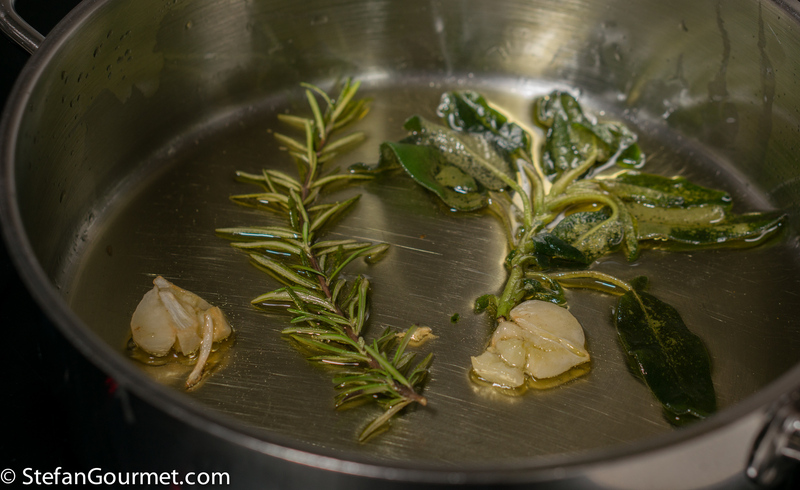 Add 2 cloves of garlic, peeled and flattened, a sprig of rosemary, and a sprig of sage. Cook over low heat until the garlic starts to color, then take the garlic and herbs out of the pan and discard. 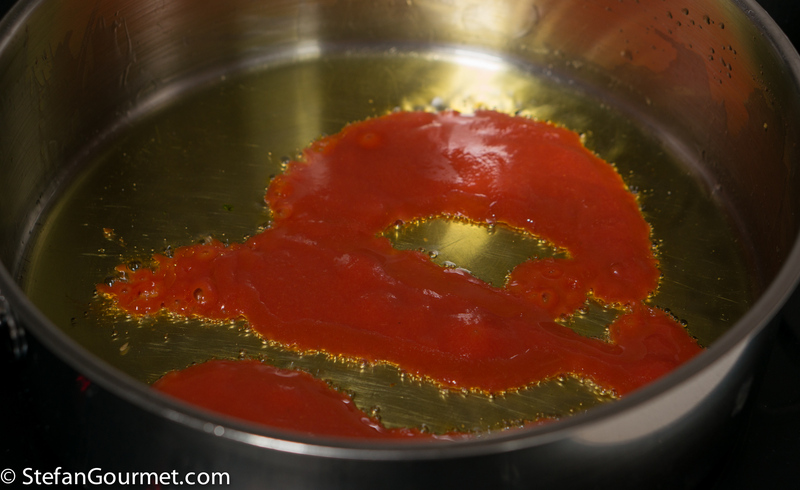 Add 120 ml of sieved tomatoes to the infused oil. 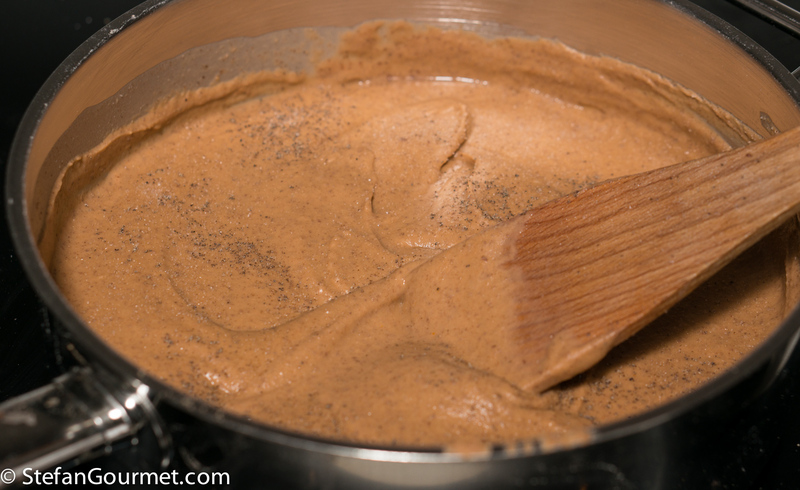 Stir in the pureed beans and season to taste with salt and freshly ground black pepper. 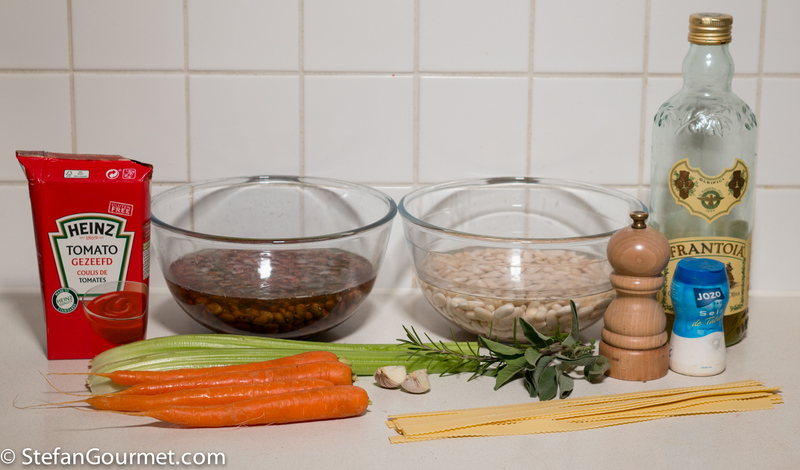 Boil the carrots for 10 minutes and the celery for 4 minutes in salted water, along with the pasta until it is al dente. 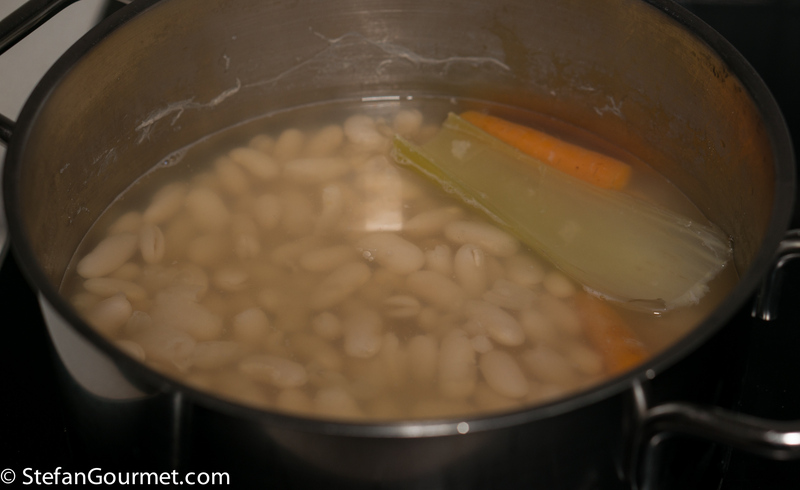 Serve the bean soup with the whole beans scattered on top, as well as the celery, carrot, and pasta. Drizzle with good extra virgin olive oil to finish. As mentioned in the introduction, this is great with red Burgundy. Other earthy pinot noirs may work as well. We enjoyed it with a Morey Saint Denis. 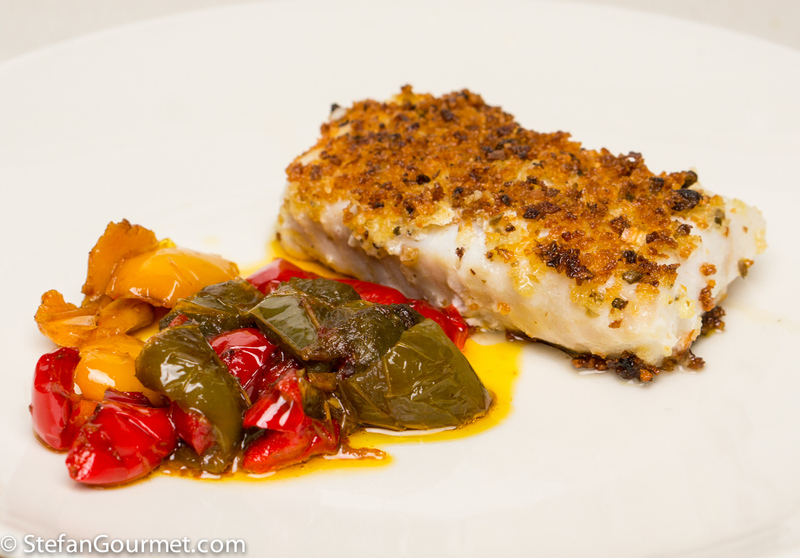 Breaded wolffish with anchovy-braised peppers is an original dish that I came up with, but its flavors are definitely inspired by the Italian cuisine. Anchovies is what combines the two elements of this dish: the bell peppers are braised with anchovies, and anchovies are also used to flavor the breadcrumbs used for breading the wolffish. You could think of this as a gourmet version of classic fish fingers. Can you do this in the instant pot? If so, how? Pretty much the same way I make it. I read your recipes with delight and rarely comment, but this one sounded so appropriate for the terribly cold weather we’re having in San Francisco with nighttime temperatures plunging to 7 or 8 degrees Celsius. Thank you for a ‘double’ recipe! 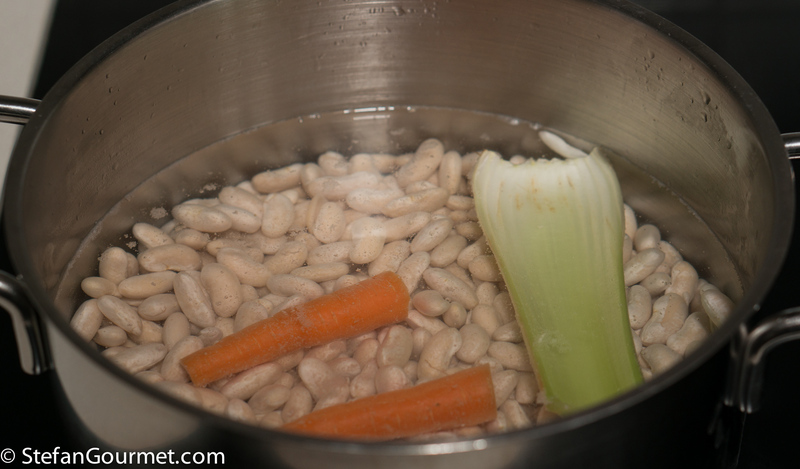 Had missed the fish one and think this is the first time I have seen the Tuscan bean soup photographed in such an appetizing way! Shall try it with one of my favourite Australian pinot noirs . . .
A wonderful dish, Stefan, and clever way to serve your guests while taking into account their food issues. And you’re right, this soup is perfect for this time of year. It’s probably yet another “across the pond” issue but here, Borlotti and pinto beans are not the same. Here, Borlotti beans are also called cranberry or Roman beans. Thanks John, I should have written they are similar. According to online sources, cranberry beans are also similar but not the same as borlotti. It can be hard to find the exact same bean on another continent, but I doubt it makes a noticeable difference in the final dish. Nicely illustrated recipe. I’ve had what my Italian friend made and called “Minestra di Fagioli”, but it was not puréed. I like the sound of the puréed version. Will be giving this a cook, but I must confess, a bit of pancetta might make it’s way into the pot. I’m thinking Syrah will work for me, but a Eha’s Pinot would work for me as well. 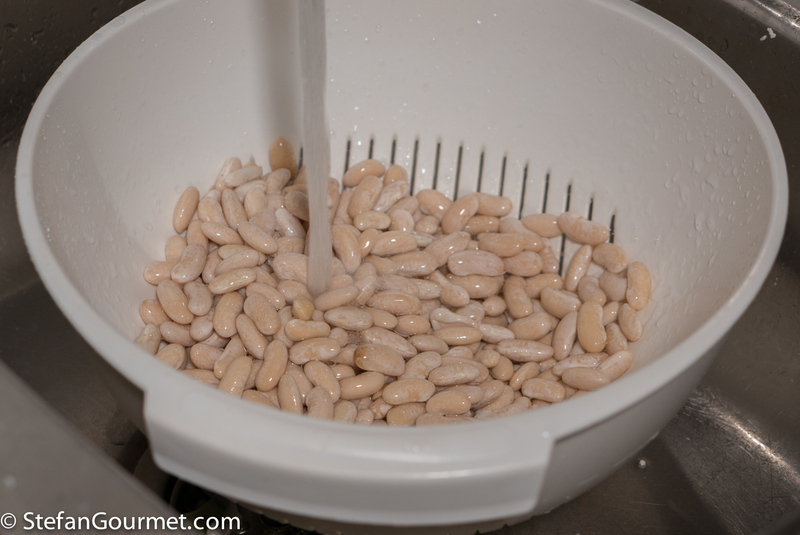 There are many versions of minestra di fagioli, also depending on the region. Pancetta is not in the Tuscan version I think, but it sure would be nice. 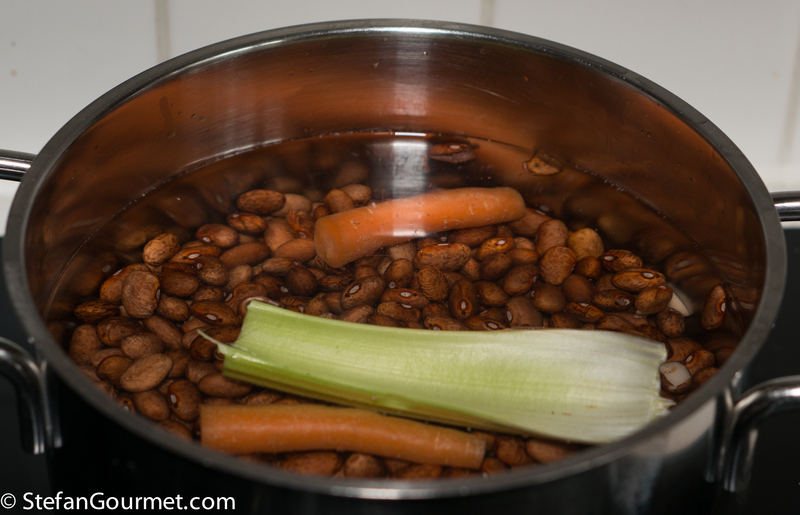 Pureeing part of the beans is great for the texture. Would not change one thing. This is some good cooking! Lovely presentation Stefan. 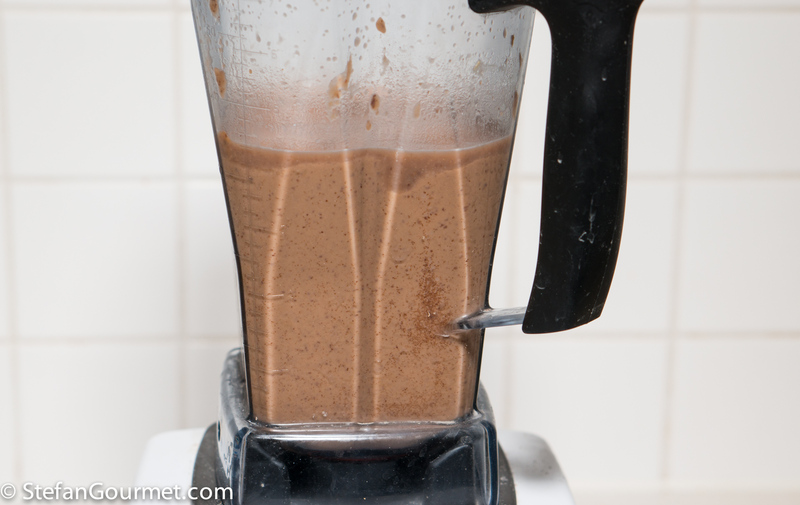 The blended beans must be very good for the body and would make a great basis for a variety of soups.